One of the key things about coffee is freshness. It’s the reason that any coffee shop worth its salt grinds their own beans, with the very best grinding small quantities very regularly. At home, it’s difficult to get a decent grind out of most domestic grinders….blade grinders just obliterate the beans, and they do that unevenly, domestic burr grinders are better but still leave the grind too coarse in my experience, OK for a filter, but no good for espresso. Pre-packed ground coffee is the best option for most people, but there’s a trade-off there…the wonders of modern packaging might keep the ground coffee inside in decent enough nick, but by the time it ends up in your measuring spoon, it could be months old. And in coffee terms, that’s not good. Not good at all. 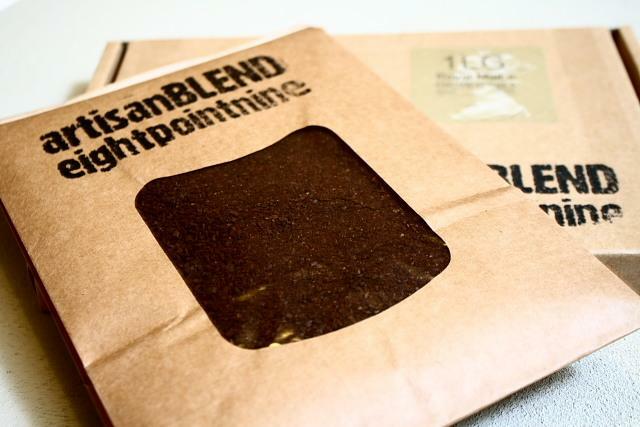 eightpointnine have come up with a neat little solution to this problem…on demand blends. The idea is that coffee is blended, ground to your needs, and personalised to your particular style. The coffee arrives in the past flat-packed in a thin box designed to go through a letterbox. A quick shake of the bag in the box snaps it back into shape. The ‘personalised to your particular style part’ is interesting. 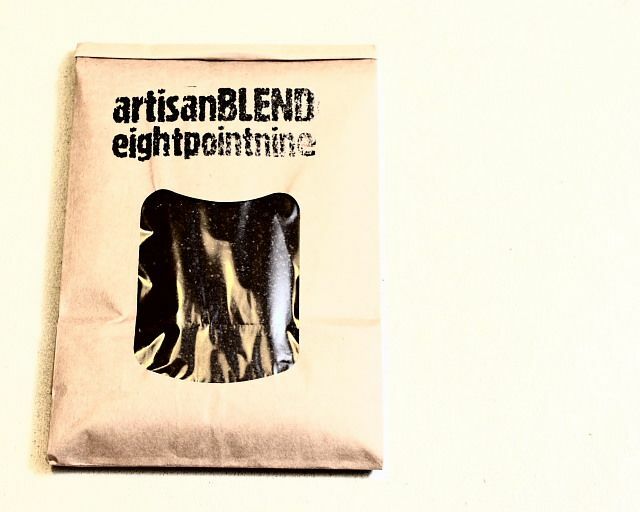 eightpointnine’s website lets you blend a bag of coffee just the way you like it by adjusting a couple of sliders to set the flavours and body. This translates into a custom blend that’s ground to your order. The real power of this is that each bag could be different – it’s a great way of exploring the complexities and subtleties of coffee. Another angle to eightpointnine is the concept of subscription coffee…sign up to a regular supply of freshly ground coffee, at the start or end of the week, weekly or fortnightly. Each bag holds enough for sixteen cups, each using 8.9g of coffee, hence the name. Following the in-box instructions to the letter – 8.9g, a set amount of water and 240 seconds to steep produced a wonderful cup of coffee, deep, spicy and rich with floral tones and a hint of acidity. It was noticeably better than the bog-standard Douwe Egberts I switched back to when my eightpointnine coffee ran out. Kris Hewitt, eightpointnine’s founder pointed out that some of the points I made about artisan sellers and small outfits on my Keevil & Keevil post ring true for eightpointnine – they’re “in effect a small artisan shop that you just don’t find on the high street anymore”. I think that’s absolutely right – it’s fantastic to see a little company with a great idea start to fill a niche with a superb artisan product, and what a product it is…the packaging is slick and attractive, the concept is imaginative and addresses a shortfall other coffee producers can’t nail, and the coffee itself is wonderful. It’s on the pricey side at £5.89 a delivery, but when I think that I often pay thirty-five pence for a mean little cup of instant coffee from the so-called ‘coffee’ machine in the office (latte? Pffffftt…), it doesn’t seem so expensive. A cup of eightpointnine works out at a shade under thirty-seven pence, and, believe me, it tastes a whole lot more than tuppence better than that rank machine coffee. I think that a pretty much direct comparison with God-awful machine coffee is reason enough to give eightpointnine a try, but then there’s the sense that if you want a good, artisan product, made with skill and care, you should be ready to pay a slight premium for it. In that sense, it’s not that expensive at all. If you’re quick, you can try eightpointnine out for free…just use the code at the top right of their website to get a free order. I’d be willing to bet that it won’t stop at just one delivery.